When we talk about someone being unable to see the forest for the trees, the characterization is disparaging. We represent this hapless person as overcome by a mass of detail and lacking the means to perceive the organizing pattern that binds constituent parts. But I like to get a little lost now and again in carefully observed particularities, and what better place is there to lose oneself than among trees? What follows in this post is a succession of arboreal associations and discussion of forests and trees both distant and near. The Kobayashi weekend retreat and surrounding forest. Image courtesy of Dwell Magazine; photograph by Dean Kaufman. 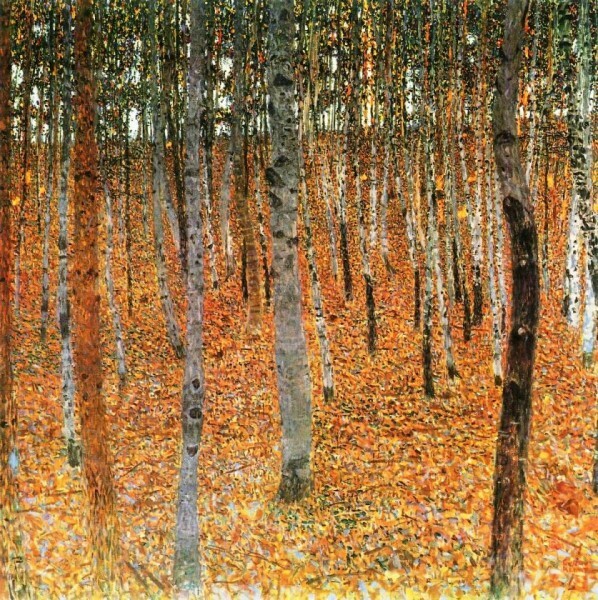 Gustav Klimt, Forest of Birch Trees, oil on canvas, c. 1903. Image courtesy of the Hammock Papers: A Forest of Things. Looking through Karen Johnson’s wonderful Seattle blog, the sealth life, recently, I came across a post about a story in the May 2011 issue of Dwell Magazine. 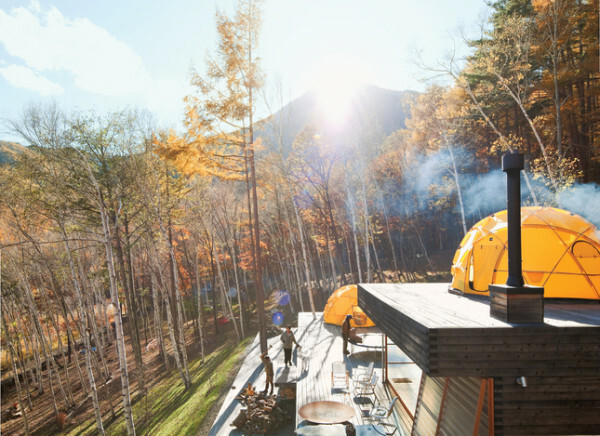 I was immediately drawn to the bright yellow tents of Setsumasa and Mami Kobayashi’s platform studio and recreational retreat in the Chichibu mountain range of Japan. The tents looked, to me, like giant handle-less umbrellas planted upon the platforms. As I paged through Dwell’s slideshow, though, it was the forest surrounding the Kobayashi’s structure that came to the foreground. I was reminded of Austrian artist Gustav Klimt’s paintings of birch trees. In one of his autumnal pieces, gracefully sinuous trunks seem to flicker amid a richly detailed pattern of green, yellow, and orange leaves and dappled sunlight. Klimt’s painting is a mediation on painterly surface and botanical pattern. Lovingly observed and rendered, his forest stand is at once visually lively and arrestingly still. The fiery branches of a Coral Bark Maple near Seattle’s Ravenna Park. Image by the author. A quartet of trees near Ravenna Park, Seattle. Image by the author. Closer to home, the Pacific Northwest is known for its cedars and the snow that falls on them, but my own neighborhood favorites are slighter and less solemn. 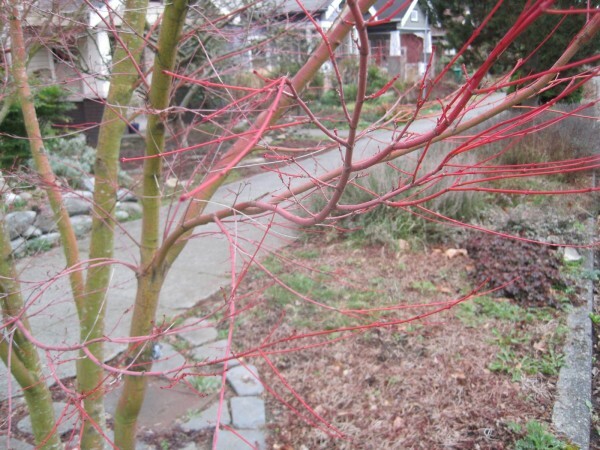 On the walk south to UW’s campus, I pass a trio of Coral Bark Maples. As they grow upward and outward, their brown bark turns shockingly red during the winter months, when so much else is muted. Nearby, four trees (perhaps Madronas?) stand across from a pocket park. Their low boughs resemble muscular limbs, and every time I pass their way, I extend my own arm and touch my hand to them in greeting, summoning their coolness and strength. Right now, brave crocuses and daffodils enjoy the lion’s share of early spring glory, but soon the avenue of cherry trees in the University of Washington’s main quad will blossom, attracting students and visitors eager to revel in their short-lived blush. For me, these trees always call to mind author Lucy Maud Montgomery’s character Anne of Green Gables, who imagined, with a fitting sense of romance, how she might like to sleep in a wild cherry tree bathed in moonlight. Mark Dion’s Neukom Vivarium, Olympic Sculpture Park. Image courtesy of the Seattle Art Museum. 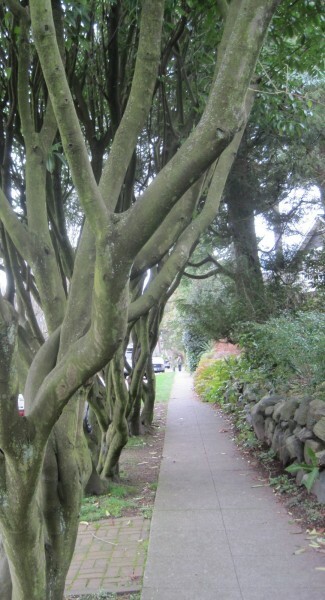 There are other remarkable trees in Seattle. 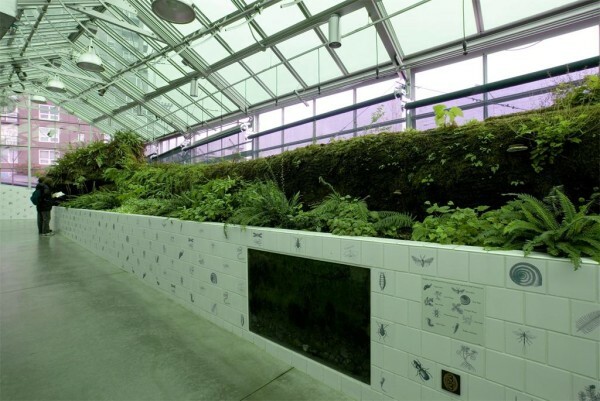 Mark Dion’s Neukom Vivarium at the Seattle Art Museum’s Olympic Sculpture Park, which marks its fifth anniversary this year, features a sixty-foot-long nurse log. Removed from the forest, where it was one among many, it is isolated here as a singular object of focus. But Dion is also interested in the interdependencies of this new greenhouse ecology, as the decaying log becomes both food and habitat for a host of organisms. He has said, “My art asks you to think about both nature and sculpture not as objects, but as processes.” South and a little east of the Olympic Sculpture Park, the Beacon Hill neighborhood, led by Friends of the Food Forest, announced just last week that it will move forward with plans to plant a seven-acre forest of nut and fruit trees, berry bushes, and herbs. The food will be available to anyone for the picking and eating. Friends of the Food Forest hope to break ground on the project this summer. Ancient Bristlecone Pines. Image courtesy of Wikimedia Commons; photograph by Rick Goldwaser. And finally, remembering a story I had heard about a tree, I returned, yesterday, to a Radiolab episode from 2010. In one vignette, we hear about a scientist named Don Curry. 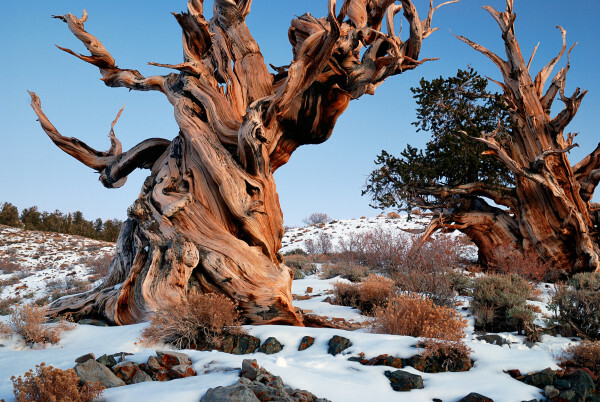 Working as a graduate student in 1964 on climate change research, he traveled to a grove of gnarled Bristlecone pine trees in western Nevada. There, he felled one of the pines to study how changes in tree ring spacing could reveal larger patterns of centuries-old temperature and moisture variations. But as he worked to count the pine’s annual rings, he realized he had cut down a tree over 4,800 years old. In fact, he had killed the earth’s oldest known living organism. In the Radiolab episode, host Robert Krulwich describes the fallen tree a “repository or talisman for five thousand years of earth history.” Krulwich is indignant, as were many of Curry’s contemporaries, at its loss. The young scientist had unwittingly failed to see the tree for the larger question of the history of global climate change. Thereafter, he gave up trees altogether and devoted the rest of his career to studying treeless salt flats. There is a collective of artists in our city called The Seattle Phonographers Union. They record and remix ambient sounds to create sonic experiences that attune our ears to both the strangeness of everyday noises and to the curious familiarity of sounds we’re not accustomed to hearing. The group writes thoughtfully about its purpose, “The goal is not to excite, confuse or entertain per se, but to attend to the world, which is much more detailed and diverse than any one person’s perception of it.” Working to see both the trees and the forest likewise helps us to attend to the world and also to recognize its abundant variety and inherent mystery. However fine and perceptive our observations of its peculiarities, it will always remain, almost magically so, beyond our individual mastery.